The New Holland brand of mini and midi excavators are workhorses of the construction industry. When your final drive or travel motor breaks, you need help fast to keep you running, and MiniFinalDrives can help! When you call us or order online, you'll quickly see how much we genuinely care about you and treat you as customer for life! Our focus on Quality, Value, and Service will be apparent when you install your drive and see how well it fits and performs. 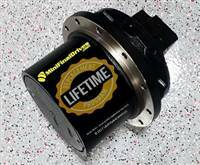 With our Lifetime Replacement program, you can be confident your final drive motor will be running smoothly for years to come. When your New Holland excavator final drive motor is broken, give us a call, and we'll get you fixed Fast!